Increasing or decreasing the pressure of individual valves on your SHBA2 series Automatic Horizontal Baler will directly affect the efficiency of the production as well as density of your bale. Please follow the steps below to adjust valve pressure on your Auto-tie baling machine. Remember to refer to the recommended safe working pressure stated on your Operator Instruction Manual (i.e. see picture below) to ensure you do not go above the limit. 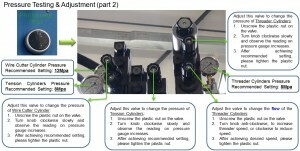 * To perform pressure testing, you will require two persons to do it. 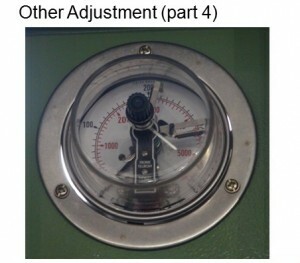 One person is to press the “pressure test” button, and the other is to read the pressure gauges and adjust a suitable pressure setting. * Do NOT press the “pressure test” button too frequently or for a prolong period of time. We suggest to keep it within 20 seconds each time. * When you are adjusting the pressure value, please adjust a little each time (i.e. not exceeding 2 Mpa per adjustment). Press down the black cap. Turn the black cap to set both the red indicators to recommended value: 16Mpa (160kg/cm²). 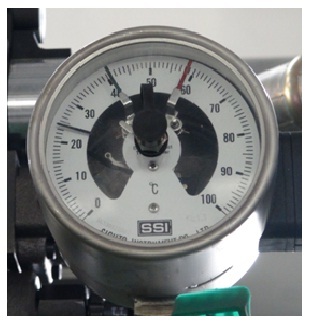 So when the pressure of main cylinder reaches 16Mpa, the tension cylinder will release pressure. Note: You can set this value higher, but it should never exceed the set pressure value for main Ram. This is to control air cooler and set high temperature alarm. Open the black cap, screw the green indicator to 30℃， and the red indicator to 60℃. So when temperature reaches or exceeds 30℃ , the air cooler will start automatically; and when temperature reaches or exceeds 60℃, the alarm will go off.